It's been a long week, and it's time to have a little fun. Tomorrow, as you might have heard, is the end of the Mayan calendar, and while I don't subscribe to all the hype and hullabaloo, I thought it might be a little fun to find some coupons to help you prepare in case you survive the apocalypse. -- Welcome to the Apocalypse 2012 Cookbook. What happens when you combine the outlandish dark-humored concepts of Dr. Strangelove with America's love of cooking? 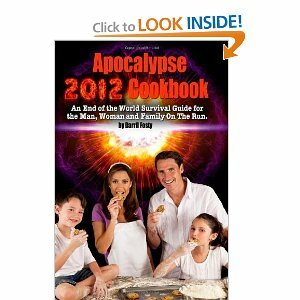 You get the satirical and outrageously funny Apocalypse 2012 Cookbook. Written by the award-winning documentary filmmaker and sports historian, Darril Fosty, the book pokes fun at America's love for cookbooks, while exploiting the much anticipated doom supposedly predicted by the ancient Mayan Indian calendar. The premise of the book is quite simple. It attempts to answer the question: 'Now that the world has ended, what's for dinner?' Included in this 100-page guide are numerous recipes that can be prepared using basic ingredients and an aggressive hunter-gatherer approach to post-apocalyptic grocery shopping. The recipes include tips on making an Edgar Caycadilla, or preparing a Four Horsemen of the Apocalypse Bean Salad for your family and friends. For the reader who can appreciate politically incorrect humor the book will be a welcomed addition to their anti-establishment libraries. However, anyone who believes that the world will end on December 21, 2012, this is an investment and brand of humor that they may wish to forego. -- Start reading Apocalypse 2012 Cookbook on your Kindle in under a minute!